– Ennis Cosby, son of Billy Cosby; inspiration behind Theodore Huxtable’s character on The Cosby Show and the Hello Friend website. 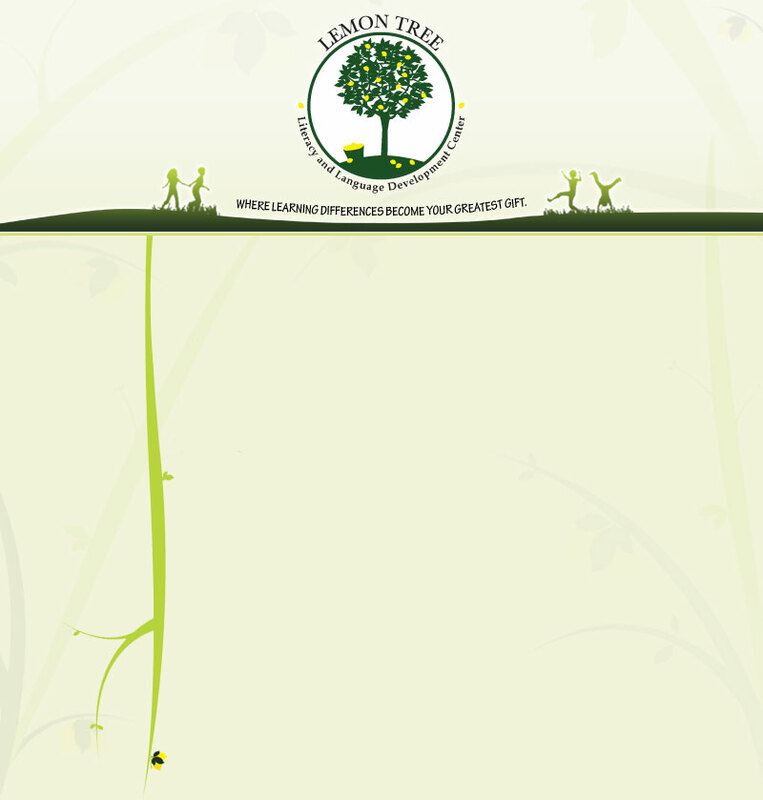 Lemon Tree draws from a variety of highly effective researched-based programs that have proven to yield signiﬁcant results in literacy and language development. The treatment programs target the root of the underlying deﬁcit by successfully retraining processing pathways that make reading, writing, and language more efﬁcient. All materials are appropriately paced, providing sufﬁcient opportunity to review, retain, and master concepts. Each program is carefully tailored to meet the individual needs of each student and is enhanced with a structured and multi-sensory approach to learning. Our Therapy Programs are described in more detail in the Programs section of this website. Lemon Tree provides individual or small group instruction, depending on individual/family needs. Individual instruction is ideal for the child who learns best in a personal, one-on-one setting. The frequency, pace, and style of individual therapy is tailored to meet the speciﬁc needs of your child. Group instruction provides families with a less costly treatment option while allowing beneﬁcial opportunity for social and emotional growth that is not always available with one-on-one instruction. The small group setting makes the learning process interactive and fun while providing children the invaluable opportunity to learn from one another. Students are carefully grouped according to matched objectives, skill level, and scheduling availability. Sensitivity to age and temperament is also carefully considered. Due to the tricky nature of meeting matching criteria, the option of small group instruction may not always be available for every child. If there is not an appropriate group for your child that meets matching criteria, Lemon Tree will always offer you the option of individual instruction. Our specialized instruction also considers the importance of maximizing sensory processing with various facilitative techniques and programs. Sensory breaks are incorporated as needed. Self-directed sensory enhancement techniques are encouraged throughout. Small durations of (supplementary) computer-assisted instruction may be incorporated during treatment sessions and/or recommended for home practice. Facilitative strategies to improve organizational skills, study habits, and social skills may be integrated throughout the lessons as needed. While we always strive to help our students “stay with the pack,” we work hard to strike a healthy balance between working smart, playing smart, and resting smart. Bottom line: kids need to be kids! For this reason, the treatment schedule is determined by you, allowing you to strike that right balance for your child. Treatment frequency is primarily dependent upon your child’s level of need and therapy objectives. As a general guideline, the longer the enrollment, the less intense the recommended frequency; the shorter the enrollment, the more intense the recommended frequency. The demands of your family’s schedule, budget, and your child’s learning stamina are also taken into careful consideration. We are committed to helping you choose the frequency option that best meets the needs of your family. As a guideline, families traditionally opt to receive 30-60 minute therapy sessions on a once to twice weekly basis. More intense and concentrated forms of instruction may be received if deemed appropriate. Lemon Tree operates on a fee-for-service basis; no long-term contracts for a ﬁxed number of treatment sessions are ever required. We currently accept private pay as our only payment program. Regretfully, most insurance companies deem our services as educational as opposed to medical. For this reason, we are not insurance providers and do not bill insurance companies. Lemon Tree’s professional staff is comprised of speech therapists holding Master’s degrees, licensed by the Board of Medical Quality Assurance, and certiﬁed by the American Speech-Language and Hearing Association. Our speech therapists are speciﬁcally trained to treat language-based learning differences using highly effective researched based intervention. We pride ourselves in creating a trusting, caring, and positive learning environment for our students. Our specialized instruction, unique teaching philosophies, and deep rooted understanding and passion for learning differences set us apart from large broad-based practices or national chain learning centers. We believe in a team-family centered approach to learning. The most integral members of our team are the student’s family. We encourage the involvement of the entire family and welcome your observation, input, and participation. No one knows their child better than family. Family members’ instincts are critical to guiding the therapy process and maximizing its success. Family involvement also insures increased opportunity for home practice and carryover of learned material to daily living. We also believe in the importance of consulting regularly with our students’ “extended family” – teachers and health care professionals - on their progress and ability to carryover goals outside of the therapy environment.